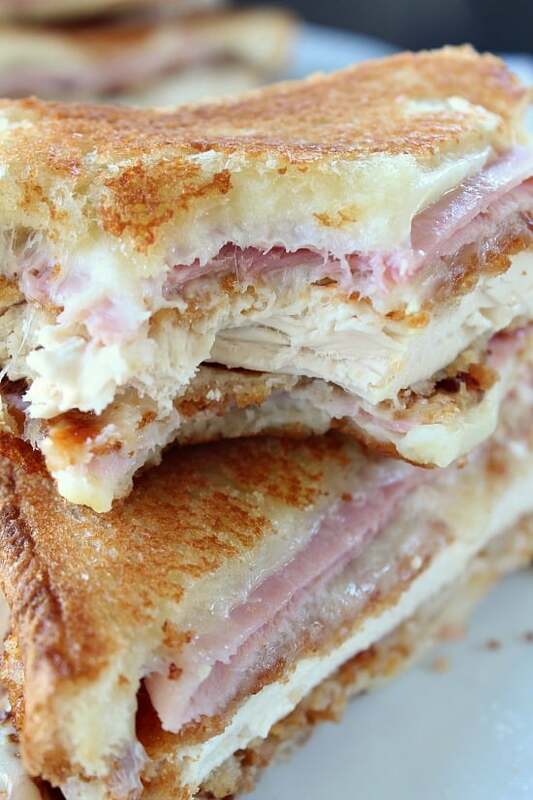 Chicken cordon bleu made into a grilled cheese sandwich? 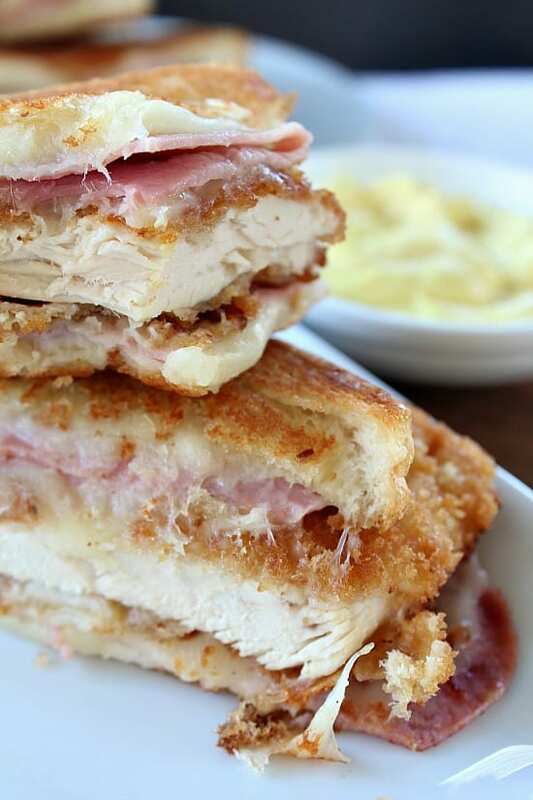 Yep, talk about delicious, this chicken cordon bleu grilled cheese is absolutely incredibly. I know it sounds crazy, but trust me on this one, this is seriously one of the best grilled cheese sandwiches I’ve ever eaten. 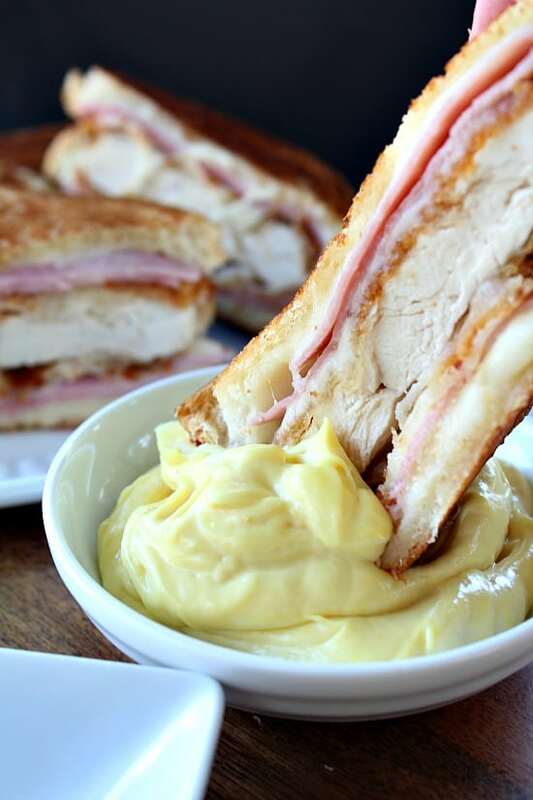 Such a great comfort food made into a hand-held sandwich that will have everyone wanting more. 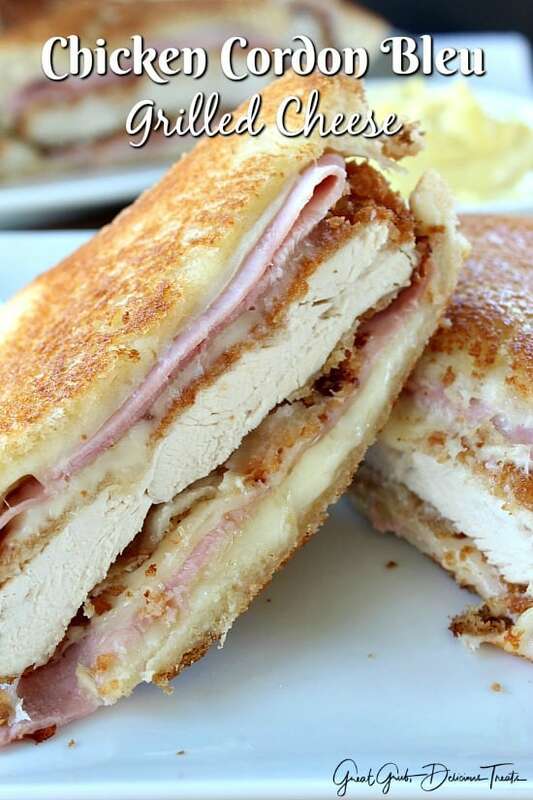 A crispy chicken breast, topped with ham and Swiss cheese, stuffed between two pieces of Texas toast and fried to golden brown perfection and then dipped into a delicious sauce. Comfort food at it’s finest. 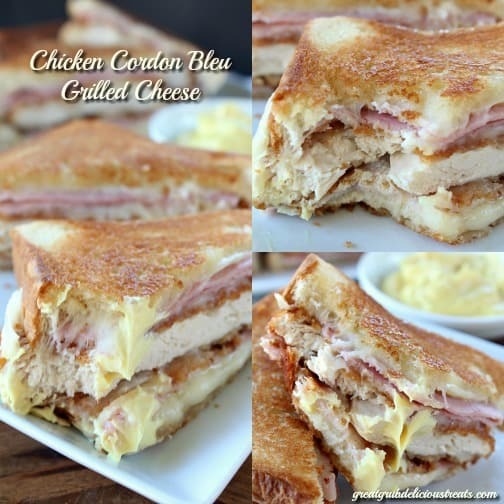 When I made my chicken cordon bleu bites, I knew then that we were going to have to make this delicious tasting grilled cheese. This is so yummy. 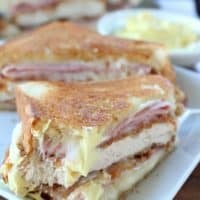 There’s just something about the combination of ham, swiss cheese and fried chicken breasts, along with the dipping sauce, that makes this grilled cheese irresistible. 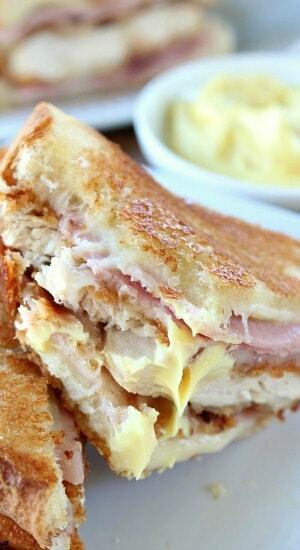 The crunchiness of the chicken, along with the crispiness of the bread make this one tasty grilled cheese sandwich. It’s also super filling and totally such a satisfying meal. To make this, pound the chicken with a meat mallet to the desired thickness. You can also cut your chicken breasts in half lengthwise (great idea from my boss Corrie) so they are not too thick. Then just continue with the directions in the recipe below. Even though you are using 4 pieces of Swiss cheese on each sandwich, adding another couple of slices will just make it that much more cheesier. Yum! Grilled cheese doesn’t just contain cheese anymore. Skies the limit with the different types of grilled cheese sandwiches that you can make. This is amazing, try it today! 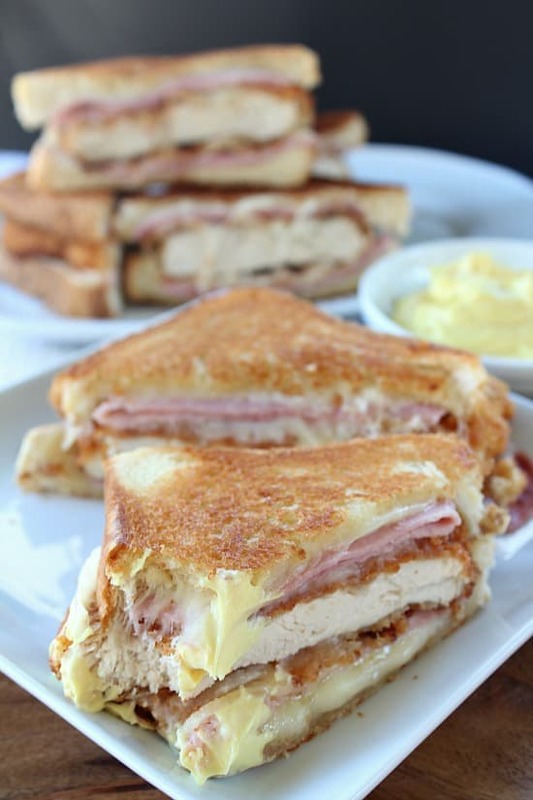 Here are a few more delicious recipes you can find on the blog: Chicken Cordon Bleu Bites, Fried Egg Grilled Cheese Sandwich, Cheese Toast Bacon Grilled Cheese, Crispy Veggie Sandwich, and many more delicious recipes. Pound boneless skinless chicken breast with a meat mallet to desired thickness. Dip each chicken breast into milk. Add flour to large baggie and add chicken, one breast at a time, to coat. Remove from baggie and dip into milk again. Next, press into Panko® bread crumbs to coat. Add chicken to hot skillet. Sprinkle with salt, pepper and seasoning. Cook approximately 8-9 minutes on each side, or until golden brown. Once cooked, remove and place on plate lined with paper towels. In a deep skillet, with a lid, heat over low heat. Add bread, buttered side down. 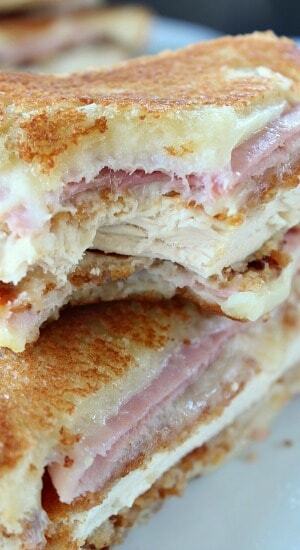 Top each piece of bread with 1 slice of Swiss cheese, 1 slice of ham, then another slice of Swiss cheese. Add a piece of chicken on top of the Swiss cheese. Top chicken with another slice of Swiss cheese, 1 slice of ham, then 1 more slice of Swiss cheese. Place bread on top, buttered side up. Cover with lid to help melt cheese. Mix mayonnaise and mustard together (this is great for dipping your sandwich into).